It seems that everyone has a cake they prefer to get on their birthday, and in our family, it’s come down to two frontrunners, one a flashy store-bought treat, the other a homemade favorite. In one corner, we’ve got what we call the “choo-choo-train cake” from Baskin Robbins. Many of you might remember this cake from your childhood: chocolate cake and ice-cream (usually strawberry or vanilla flavor) rolled into a cylinder and decorated to look like a train. Large cookies form the wheels, an upside-down cone forms the smoke stack, and the rest of the details are created with large quantities of frosting. 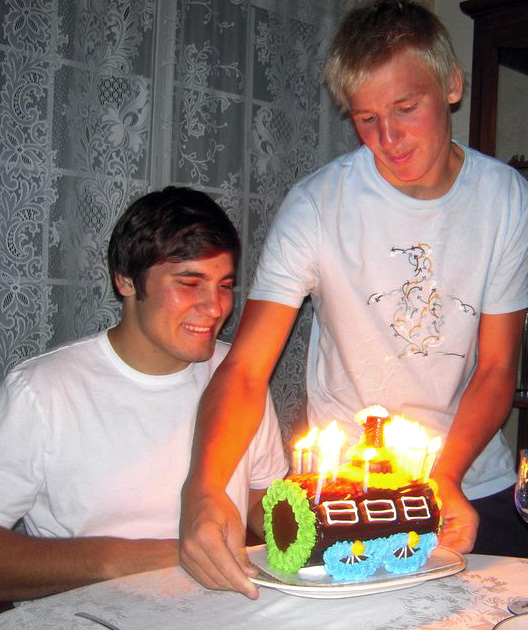 For Jan and his brothers, this cake is the birthday tradition, the thing they’re always happy to see headed toward them covered in candles. With its bright, bold colors and solid ice-cream construction, this cake always looks good. Growing up, my birthday cake of choice was the classic Swedish birthday cake, or tårta, made by my mom and dad. The cake is simple: moist white or yellow cake piled high with whipped cream and fresh berries. While the appearance of this cake is less predictable than that of the choo-choo train cake, sometimes looking like a beautiful creation, other times looking more like a train wreck, it is always delicious, and to me, the cake tastes like pure summer. And despite the consistently neat appearance of Baskin-Robbins’ cake, the Swedish birthday cake is starting to gain ground at family birthday celebrations. I made the cake once for my father-in-law, which he described as looking like a cake hit by an atomic bomb. But before I could get offended, after a few bites he went on to say that it was the most delicious cake he’d ever eaten, and asked if I could make this cake all the time. The reason the cake can be so ugly sometimes really depends on the time of year that you make it. During the summer, when you’ve got fresh strawberries, boysenberries, and raspberries to use, the cake will look the best because the berries are fresh. It’s in using frozen berries where the cake’s appearance starts to deteriorate. After thawing the berries and allowing the juice to drain, there still remains juice to soak into the whipped cream and turn it into a garish shade of pink. But then, there also seems to be a strange relationship between the cake’s appearance and rave reviews: the uglier it looks, the better it tastes. Making the cake is simple: use a cake box mix for yellow cake (I don’t have good luck baking cakes from scratch so I always take this shortcut) and follow the package directions, baking in two 9” round pans. After baking, allow the cakes to cool completely before frosting. Use a stand mixer to whip the whipped cream, adding powdered sugar to achieve the desired sweetness. Place the first layer on the plate you wish to serve the cake, and cover with whipped cream and berries. Another secret: don’t add sugar to the berries, or the juice from them will soak into the whipped cream. Add the next layer and cover the top and sides with the remaining whipped cream. Add the berries to the top and sides of the cake and the cake is ready to serve. Now for my birthday last week, my dad said he wanted to bake me a cake, so of course I requested my favorite, the Swedish birthday cake. He did a good job too—looked good and tasted delicious. I began to doubt my previous conclusion about the cake ugliness-to-tastiness ratio. Maybe after years and years of baking the same cake, we were all improving. I was even getting requests from the people who always picked the choo-choo train cake. For Jan’s birthday last April, he got to celebrate with each cake at two different birthday dinners, so he didn’t really have to choose. I’ll take that as a small victory—slow, but steady progress. And with fresh strawberries to use, the finished cake looked neat and tidy, with no signs of melting or pink whipped cream. It was definitely the best looking iteration of the cake so far (see picture at top of this post). Unlike boxers, for my favorite birthday cake, the more time it spends in the ring, the prettier it looks. 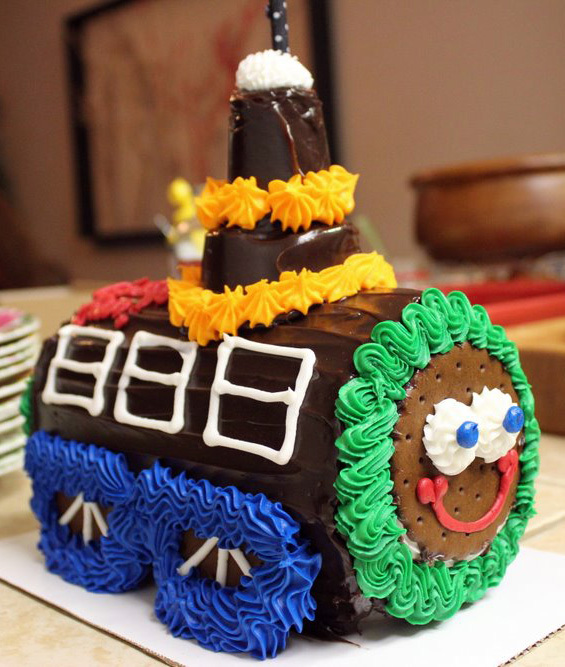 Watch out, choo-choo train cake. Yes, it’s always hard to choose between desserts 🙂 Miss you too!! Hi Anna, I am going to make this cake for my ex-mother-in-law who turns 93 on this coming Saturday. I love reading this blog and I don’t think I have ever posted a comment before. 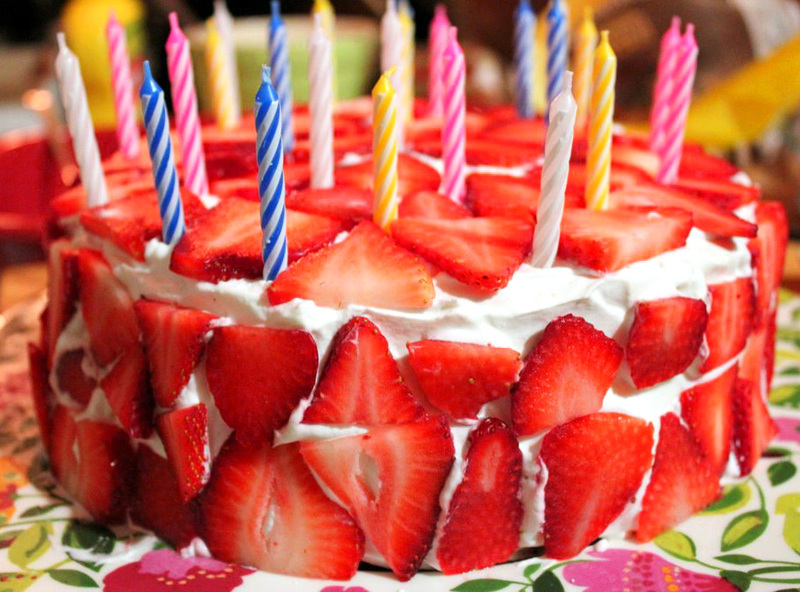 A giant strawberry shortcake. Wonderful! The strawberries on top of the whipped cream is a sure winner. I’ll bake this cake for my birthday, it’s good to bake something new every once in a while.